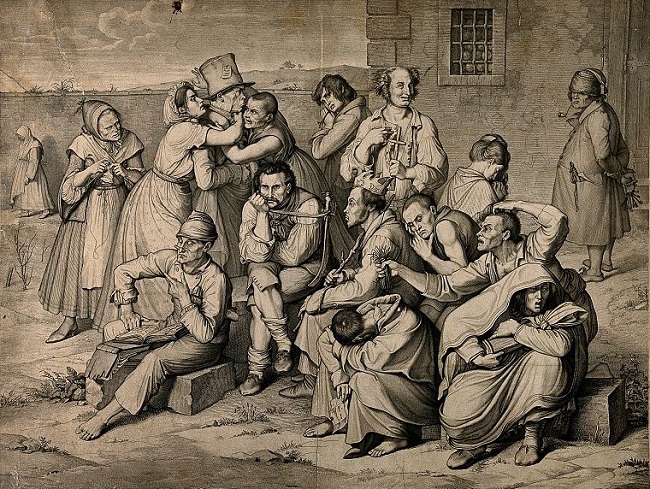 “Mentally ill patients in the garden of an asylum” (c. 1829–34). Engraving by K. H. Merz, based on the painting Irrenhaus [Madhouse] by German artist Wilhelm von Kaulbach. Image courtesy of Wikimedia Commons. This past week Stonehearst Asylum, a feature film directed by Brad Anderson and starring Kate Beckinsale, Michael Caine, and Ben Kingsley, premiered in theaters and on premium cable services. The movie is based on Edgar Allan Poe’s story “The System of Doctor Tarr and Professor Fether,” which had already been adapted for the screen several times, most notably as the 1973 Mexican film The Mansion of Madness and the 2005 Czech film Lunacy, and had even been the inspiration, in 1976, for the debut single—and first Top 40 hit—by the recording act The Alan Parson Project. The latest adaptation is tame compared to other recent American thrillers; in the words of one reviewer, “Kingsley and Caine compete to give the hammiest performance.” Moviegoers unfamiliar with the original, however, wouldn’t know that Poe’s story is not one of his Gothic tales of horror but is instead a rather offbeat, if dark, comedy describing one of the wackiest dinner parties in all of American literature. Like the latest movie adaptation, Poe’s story is set in a mental hospital turned upside down. A number of Poe experts have argued that the asylum imagined by Poe is American democracy gone mad (several of the inhabitants seem to share characteristics of certain nineteenth-century politicians), or that the story is—in the words Italian writer Alessandro Portelli—“a satire of the revolutionary utopia of popular self-government.” Other scholars have contended that the story, with its references to the South and its tuneless orchestra playing “Yankee Doodle,” satirically depicts a slave rebellion and reflects Poe’s hostility to Northern abolitionist rhetoric. Still other critics have asserted that Poe might have been inspired by Charles Dickens. The two writers met in Philadelphia in 1842 and shared correspondence about literary concerns. That same year Dickens visited the newly opened Boston Lunatic Asylum, where the resident physician announced the facility’s guiding principle: “Evince a desire to show some confidence, and repose some trust, even in mad people.” Soon thereafter, Dickens published the travelogue American Notes for General Circulation and included comments about the “conciliation and kindness” he witnessed during his visit to the hospital: “Every patient in this asylum sits down to dinner every day with a knife and fork. . . . Once a week, they have a ball, in which the Doctor and his family, with all the nurses and attendants, take an active part.” Yet still another commentator insists that the inspiration for the story came not from Dickens, but from Nathaniel Parker Willis’s story “The Madhouse of Palermo,” which is based on a visit to an asylum in Sicily. “During the autumn of 18—, while on a tour through the extreme Southern provinces of France, my route led me within a few miles of a certain Maison de Santé, or private Mad House, about which I had heard much, in Paris, from my medical friends. . . . If you don't see the full selection below, click here (PDF) or click here (Google Docs) to read it—free!